This thrilling seawalk in the Andamans lets you go for a walk on the sea bed! You'll be wearing a large helmet connected to an oxygen tank, and can wear anything you like (as long as it doesn't restrict your movement). Seawalking in the Andamans is safe as you'll be accompanied by experienced instructors and will be walking in a netted-off area underwater. 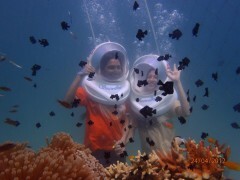 It's unlike anything you’ve done before, and is perfect for someone who has not done scuba diving or snorkelling before. You don't need to know how to swim, and you don't need to have any experience. You won't even get your hair wet or your make-up washed off! NOTE: Don't forget to carry a USB to pick up the complimentary photos of your sea walking trip in the Andamans. Elephant Beach is a lesser known destination in Havelock Island, Andamans which has spectacular sea life and a large coral reef not too far from the shore. It is a white sand beach with clear blue-green water, and is great for a seawalk adventure in the Andamans. 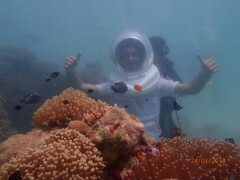 • Try the experience of sea walking in the gorgeous Andamans! 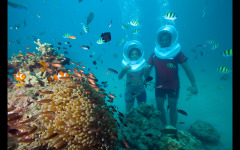 • Get close to the marvellous marine life of the Andamans. • Enjoy a long 25 minute session under water. Pregnant women and patients with heart ailments or asthma are not allowed to go on this seawalking trip in Andamans. Smoking or consumption of alcohol is not allowed during the seawalking activity in the Andamans. You must adhere to the instructions of the guide at all times during the seawalking trip in Andamans. Equipment should be handled with care. You are not allowed to touch marine life or break off coral or collect shells while underwater. If the weather is bad or visibility is low, the seawalk in Elephant Beach will not be conducted. In such cases, you will receive a full refund. For cancellations made 0-7 days before the Elephant Beach seawalk date: No refund. For cancellations made 8 days or more before the Elephant Beach seawalk date: 90% of the total cost will be refunded, minus any transaction charges. You can wear your spectacles or contact lenses during this seawalking trip in Andamans, as your face will be protected with the helmet. For women, their hair and makeup will remain dry. Do allow about 2 hours for this activity. There is no dropoff for this trip. You'll have to report to the meeting point by 08:00 hrs, from where you'll be taken to the pontoon. Here you'll find changing rooms, washrooms and lockers where you can change into your swimming costume (if you like) and deposit your bag for safe keeping. Before going into the water, your instructor will brief you on the safety measures, hand gestures and all the steps taken during the activity. Finally, you put on your gear and plunge into the water and begin your incredible walk. You'll be dropped off back at the meeting point when your sea walk is done. Trip ends here. USB/pen drive to pick up the complimentary photos of your sea walking adventure in the Andamans. • Please carry specific, personal or prescribed medication and personal first-aid kit. Elephant Beach is about 20 minutes by ferry from Havelock Island dock.